It not just a good business practice to keep your finances and your business’ separate, but your business actually needs its money to pay its bills. So don’t help yourself to it. Money in your business is like blood in your veins. If there isn’t cash (money) to flow, your business will literally die. Your business needs money in its bank account to pay its accounts (to pay suppliers, staff, rent, expenses and to buy assets like equipment, and even to pay tax). 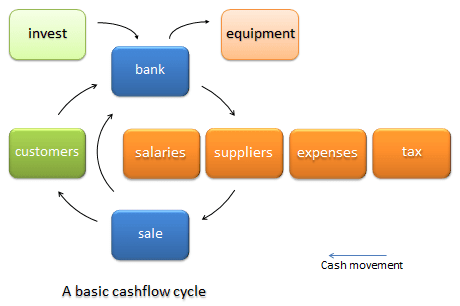 In this Cashflow diagram, someone – usually you – invests money in the business. The money (known as working capital) is used to buy and pay for things that it needs. That enables the business to function and to sell its services or products. Either the customer pays in cash or buys on credit and pays for it later. When the money comes in, it is deposited in the bank account so that the next lot of bills can be paid. And so the cycle continues. But making sales is not enough. You need to make sure that customers (also known as debtors) pay as soon as possible – preferably immediately – so that your company can pay its bills. When customers delay paying for their purchases, your company doesn’t have money to pay its bills. You can have greater control over the cashflow cycle using one of your business’ most important ‘books of account’, its Cashflow Forecast or Cashflow Projection. 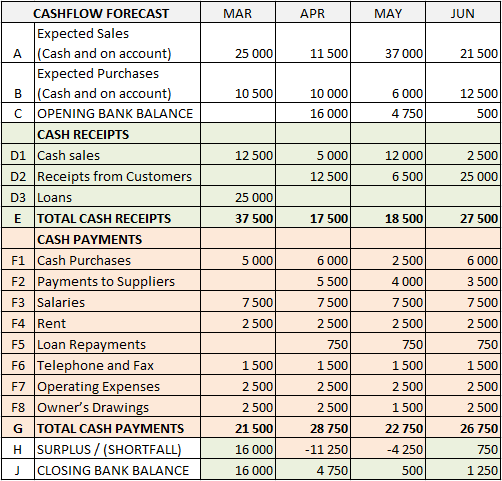 Keeping the Cashflow Forecast up-to-date will help you know how much money the business has, and will have, next week and next month. It is easy to use and is reliable, as long as you keep it up to date – preferably once a week when business is quiet, like Friday afternoons, but never less than once a month. Each time you update the Cashflow Forecast, you get a glimpse into the future so that you can see how much cash your business is likely to have in the bank. This allows you to plan for times that you expect to be lean when you may need bridging finance, and to anticipate when there will be extra cash to buy that necessary piece of equipment. You can download and adapt the spreadsheet template (cashflow.xls) provided by Do Better Business to your particular business. First enter the total amount of money that you expect to sell your product or service for in the first month (eg R 25,000), in row A. And the total amount that you expect to purchase (say R 10,500) in that month, in row B. In row D1 enter the amount of money that you expect to get for that month’s sales (eg R 12,500). In the next month, you will show the rest of the money from month’s sales (also R 12,500), received from your customers who bought on account in row D2. Now enter your business’ month-end balance from its bank statement (your company does have its own bank account doesn’t it?) in row C under the first month. Then enter all the monthly payments that you can think of in rows F1 to F8. Rather be a bit conservative with your expected income and generous with your payments. The amount in the month-end closing bank balance each month is what should be in the bank account. If that figure goes into the negative, you can expect a phone call from your bank manager. You will be asked to contribute some of your own money to your business to bring that balance back into the positive. On the other hand, if you have used realistic amounts and the bank balance gets bigger and better each month, then you are on a winning streak and your company will be able to give you some of its hard earned earnings. More cash must come in each month than goes out (to pay the expenses – including salaries and drawings – and creditors) so that there is still money left over the put back into the business so that it can grow. Click here if you want to discuss how we can help you with managing money. Do you see how easy it is to keep a Cashflow Forecast up to date, and how necessary it is for your business? What does the closing bank balance trend in this example tell you about this business?